Are you a Salinas resident? Have you been excited to see the transformation Salinas has made in recent years with new additions in the public art sphere? Do you want to see our beautiful, historic city continue to make improvements and to be a place that residents and visitors alike remember with fondness? We’ve thought a lot about these important questions over the last few months. It’s given us time to really connect with Salinas’ history and to remind ourselves of the roots this town has that have propelled it to greatness. We believe Salinas has the charm and generosity to offer everyone who visits through it’s unique history. But Salinas hasn’t always had that reputation. Now, we’re excited to be part of the process to bring a new light to Salinas. 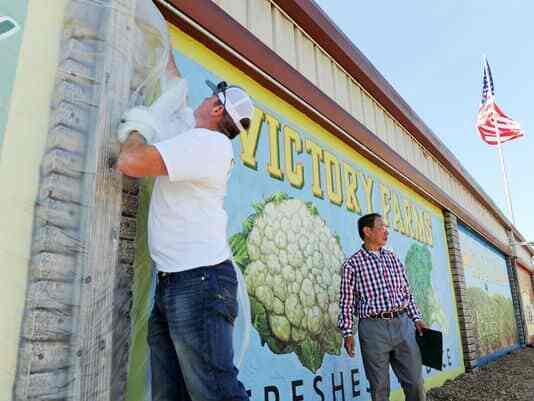 We want to see as Salinas get back to its beautiful roots with a renewal of art and history of its agricultural life. And that’s why were so excited to announce yet another advancement in the arts in Salinas. Signs by Van has been commissioned to paint a massive mural on the south side of our beloved city. Our mural, which has been commissioned by Security Public Storage, will be a one-of-a-kind mural that showcased the agricultural of Salinas. Our idea is to make this beautiful mural a landmark in Salinas, so that all who pass by this space stop and take a photo with it. We believe that we can truly make this a landmark stop as people are passing through Salinas and learning about our wonderful history. And there is nothing like art that allows people who are unfamiliar with a topic or a place to get to know it in an easy and comfortable way. Art has a way of connecting us all by a command bond of beauty. It helps us understand difficult and complex subjects in new ways. Truly, it is an equalizer across diverse populations — cutting across race, class, religion and gender — so that all viewers become equal in front of the art. What a beautiful concept! It’s a concept we hope comes through in our new public art project. Our mural is designed to truly remind us of the beauty and history of Salinas. We are on a mission to bring back beauty to Salinas, and we can’t think of a better way to do it than with a public mural that truly can be enjoyed by every resident and visitor to the city now and for years to come. If you feel as passionately as we do about Salinas and the history of our loved city, then help us spread the word about this new mural. Featuring fruits and vegetables and a beautiful agricultural scene, we believe this mural can be the backdrop for everything from produce sales to photo opps to music events. The possibilities really are endless, but bringing beauty back to Salinas really begins with you. So visit our mural today to take your own photo. Tell your friends and family. Bring a picnic, ride your bike, take your wedding photos — be creative. And then post your photos in front of our mural on social media using the hashtag #‎BreathingLifeIntoSalinas‬. Together, let’s see this mural take off on social media. Signs by Van is so excited to be part of the process. Our muralists bring their passion, energy and talent and are thrilled to be part of the history that is moving Salinas forward. Help us spread the word! And have fun as you take part in breathing life into Salinas again. We thank you!